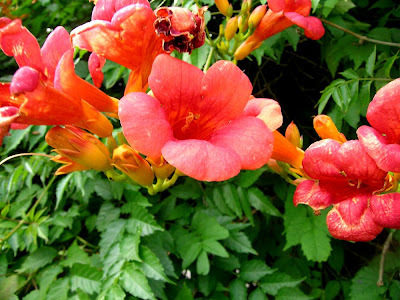 The exotic Campsis - more commonly known as the trumpet vine or trumpet creeper, is a genus of two species of deciduous climbing shrubs. One of which is hardy while the other is not reliably so. They are both vigorous with a somewhat vertical habit and are usually grown on walls where they are helpfully self-clinging. Of course, you will need to supply some suitable apparatus for them to cling onto. 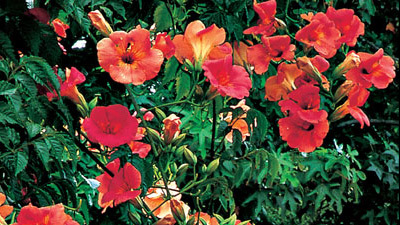 Campsis grandiflora is a native to the woodlands of China, and given a warm, protected aspect can reach a height of up to 30 ft. It has mid-green, pinnate leaves and is the least hardy of the two species. It produces 3 inch long trumpet-shaped flowers - hence the name - coloured deep orange to red. These flowers are borne in August and September. Campsis radicans is a native to the woodlands of the southeastern United States. It is the hardier of the two species, and can grow to a very impressive 40 ft in height. Slightly different to its grandiflora cousin, campsis radicans produces a significant number of aerial roots. 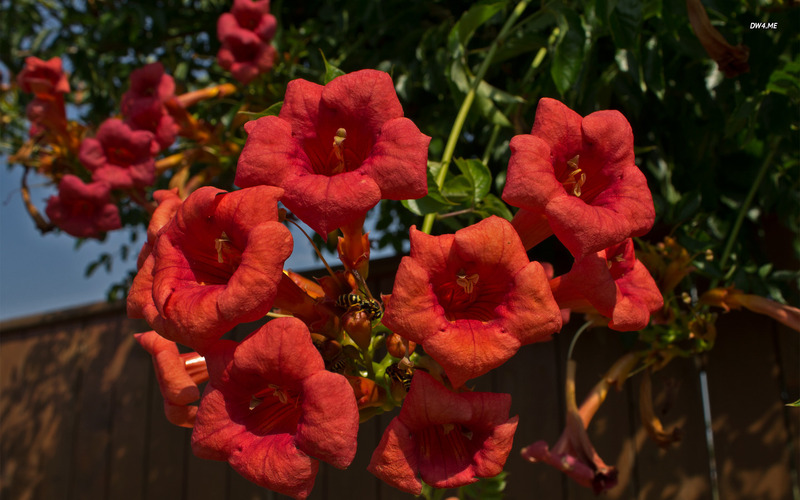 It has light-green pinnate leaves, and scarlet/orange trumpet shaped flowers. These flowers slightly differ to Campsis grandiflora as they are more tubular and less wide at the mouth. However, an excellent and hardy hybrid between the two species exists that dates back to mid-19th century called Campsis × tagliabuana 'Madame Galen'. In cooler temperate regions this hybrid will require the shelter of a sunny wall to produce its spectacular flowers in abundance. 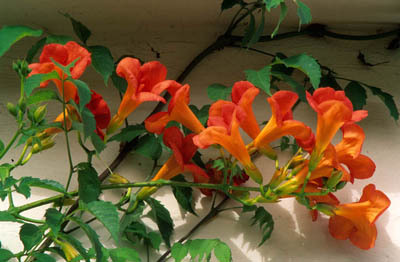 Madame Galen produces trumpet-shaped, orange to red flowers up to 3 in long that appear in loose clusters of 6 to 12. Like its parents, it is a woody, climbing, perennial vine that attaches itself to structures and climbs vigorously with aerial roots. It bears dark-green deciduous leaves up to a foot long. Its flowers are very attractive to bees, butterflies and birds. It is such a good plant that it has gained the Royal Horticultural Society's Award of Garden Merit.